This excellent online textile resource could keep me occupied for hours. You’ll find many books in PDF format on different types of needlework. If you’re just in the mood to browse and you’re interested in needlework, you’ll enjoy looking through this site! According to the title of this textile resource site, it actually deals with weaving and related topics, but many of the techniques in the digital books overlap hand embroidery techniques. They all fall into the category of needlework, anyway! Some of the books I’ve browsed through focus on drawn thread work, filet embroidery, petit point, etc. 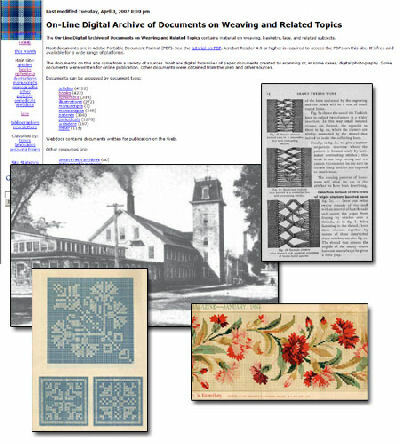 The On-Line Digital Archive of Documents on Weaving and Related Topics also contains a section on Documents Related to Lace, which also presents some great needlework books. You’ll find art journals, illustrations, manuscripts, articles – all kinds of materials published about lace making, weaving, and needlework – all in downloadable PDF files. You’ll also find historical photographs of textile-related places and people, including old postcards of lace-makers and weavers and such from Madeira, Ireland, etc. The site is hosted and maintained by the University of Arizona Computer Science Department. They’ve done a marvelous job making this resource available! This website is great for anyone interested in textiles and in research on textiles. For the embroiderer, you can flip through the publications and get all kinds of inspiration! Previous Previous post: Crucifixion Chasuble: Historical Needlework Sample – Gorgeous!